Vizio is officially launching the P-Series 4K Ultra HD TV line that the company first showed off back at CES. The P-Series includes screen sizes of 50, 55, 60, 65, and 70 inches, with prices ranging from $999.99 to $2,499.99 for the 70-incher. The P-Series TVs have full-array LED backlighting with local dimming, and they include the VIA Plus smart TV platform. VIZIO today launched its all-new P-Series Ultra HD Full-Array LED Smart TV collection to the U.S. market. With advanced local dimming LED backlight technology, support for Ultra HD streaming and unparalleled performance, VIZIO's P-Series Ultra HD Smart TV collection has been engineered to offer consumers best-in-class picture quality to deliver a comprehensive 4K Ultra HD solution. VIZIO P-Series Ultra HD Full-Array LED Smart TVs will start at $999.99 for the 50" class, with 55", 60", 65"and 70" class screen sizes also available. Full-Array LED backlighting allows for unmatched light uniformity, offering up to 72 Active LED Zones and setting the new standard for picture quality. For a more vibrant, beautiful picture, each Active LED Zone dynamically adjusts to discretely control the backlight based on content onscreen, generating deeper black levels and higher contrast levels for a greatly enhanced picture compared to edge-lit LED sets. Focused on bringing a well-thought-out 4K Ultra HD solution to market, VIZIO's new P-Series Ultra HD Smart TV collection integrates key technologies that help ensure consumers can enjoy a beautifully simple Ultra HD experience supporting the wide array of content options demanded by consumers. A critical innovation VIZIO has been developing for over two years is its Spatial Scaling Engine, which accurately and beautifully transforms 1080p Full HD entertainment into spectacular near Ultra HD. As consumption of media through streaming services continues to grow, the P-Series Ultra HD Smart TVs have been fully designed to support 4K Ultra HD streaming from providers like Netflix and, later this year, Amazon Instant Video and UltraFlix3. Amazon Instant Video customers will be able to purchase Ultra HD movies and TV episodes with select Ultra HD titles available at no extra charge to Amazon Prime members through Prime Instant Video. On top of standout picture quality, P-Series Ultra HD Smart TV viewers interested in sports or quick moving content will appreciate VIZIO's Clear Action Rate 960. With an effective refresh rate of 240 Hz, Clear Action Rate 960 ensures viewers enjoy a crisp, smooth picture with superior motion clarity when watching their favorite fast action scenes. Beautifully crisp images are further enhanced by Advanced Color Management and Active Pixel Tuning technologies. These critical innovations perfect color, contrast and picture detail accuracy for an outstanding viewing experience. Committed to providing a multitude of entertainment options, P-Series Ultra HD Smart TVs support the latest standard in streaming thanks to VIZIO Internet Apps Plus. VIZIO's latest connected platform is equipped with support for the HEVC H.265 codec and 802.11ac dual-band WiFi for a better streaming experience that is up to 3x faster. These advancements enable consumers to easily stream Ultra HD content through apps like Netflix and, launching later this year, Amazon Instant Video and UltraFlix3, with HDCP 2.2 support built-in for playback of protected Ultra HD content. Support for the latest HDMI 2.0 standards helps ensure consumers continue to enjoy their P-series Ultra HD Smart TV into the future as more CE devices enter the market, enabling playback of 4K Ultra HD content at up to 60 fps. Seamless second-screen interactivity through Netflix and YouTube allows users to search for content on the corresponding app on their Android and Apple iOS mobile devices. When the TV and device are on the same WiFi network, consumers can simply click to play the content on the big screen, controlling playback on the TV from their device. VIZIO Internet Apps Plus features a multitude of popular apps like YouTube, Hulu Plus, iHeartRadio, Spotify and Pandora, among others. Apps like Netflix and, later this year, Amazon Instant Video and UltraFlix3 allow consumers to not only stream standard 1080p content, but 4K Ultra HD content as well. To support the excellent picture quality and Ultra HD experience in the P-Series Ultra HD collection, VIZIO engineered the V6 six-core processor. Comprised of a quad-core GPU plus dual-core CPU, the V6 six-core processor delivers maximum speed and advanced graphics processing, enabling an even faster smart TV user experience. To ensure picture quality always remains king, VIZIO also enabled VM50, a dedicated motion and picture-processing engine that beautifully renders every image, including Ultra HD content, with incredible detail. Consumers can pre-order VIZIO's P-Series Ultra HD Full-Array LED Smart TV collection today at VIZIO.com. The line-up will soon begin rolling out both in-store and online through key retailers such as Amazon, Best Buy, Costco, Sam's Club, Target and Walmart. 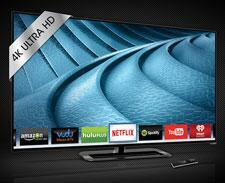 • Vizio Unveils 2014 M-Series TVs at HomeTheaterReview.com. • Vizio M551D-A2R LED/LCD HDTV Reviewed at HomeTheaterReview.com.